17 May 2012. 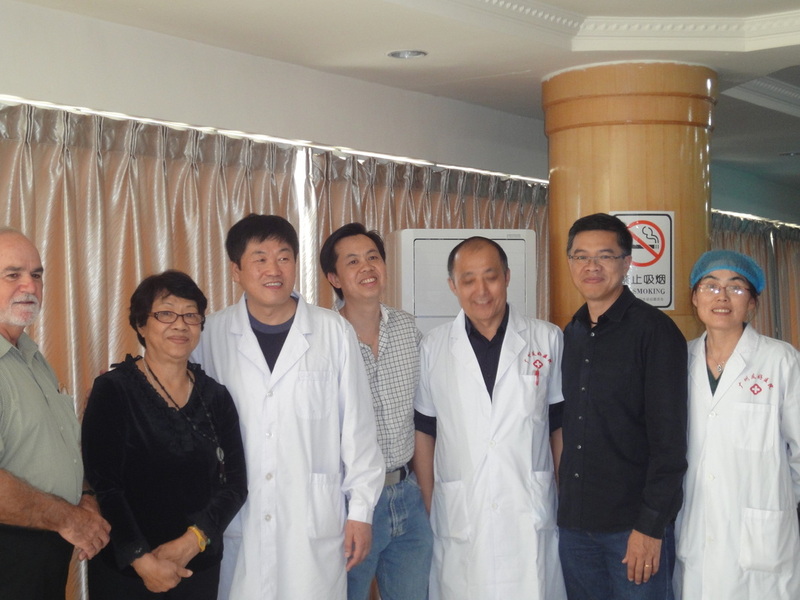 We visited Dr Li in Beijing for a check up on the tumor. Through a Doppler Ultrascan, Dr Li confirmed that the leisions in the breast has shrunked in size. Physically Mom felt the lumps had 'flatten' and shrunk! This is amazing! We are thankful that the NGPDT process had worked. There are other supplements that she is taking to help to detoxify and help the body to clear of the tumor as well. I will publish more about these soon. We are leaving Beijing in 2 days time. For those of you out there looking for alternative to Chemo treatments - look around and you can find serveral good alternatives. 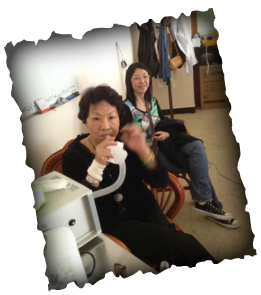 For Mom, we tried NGPDT and the process had no suffering of pains, hair loss or appetitite loss. It was smooth and effective. NGPDT Interstitial Process - finished less than 2 hrs. 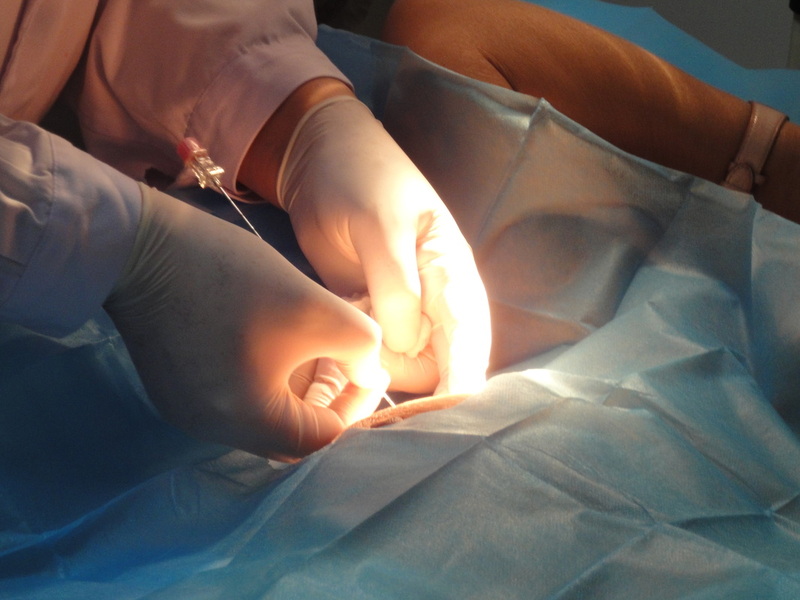 Below are some pictures of the Interstitial procedure. 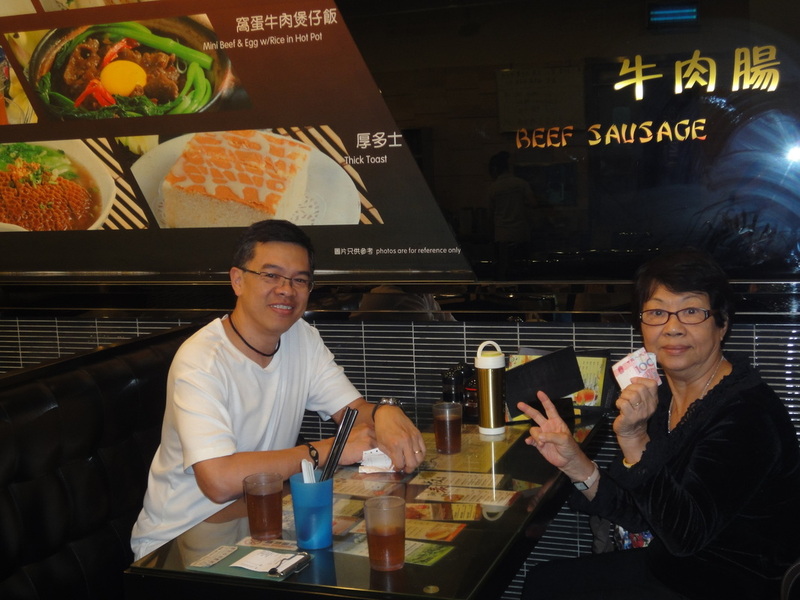 After the treatment, she walked out of the clinic, and we went for a sumptuous lunch. She was hungry! Mom's breast tumors showed clear signs of regression. This process to battle breast cancer has been a 10-month journey (June 2011-Mar2012) for Mom and for the entire family. Now I understand that Cancer is not a disease that germ-warfare techniques alone can win over. We are not fighting a bacteria, a virus or a external intrusion. With Cancer, it is fighting our own cells which went haywire. Killing our own cells got to be selective, or else it also kills to good ones. The military strategist would call killing innocent cells "collateral" damages in the bigger strategy to kill an enemy. Some of these collateral damages could be permanent, like removal of lymph nodes, or surgery, or killing the immune system etc. I am very thankful, that modern technology has allow us to come across this alternative methods of cancer treatment, called New Generation Photodynamic Therapy, NGPDT. The combination of NGPDT with nutrition, habits change and positive mindset has resulted in regression of the tumor after over 9 months. The NGPDT process, like other methods, will take time. For many of us who need instant results, this can be emotional stressful. When the first Oncologist told us in June "You got to remove the tumor now, and start the Chemo process immediate, or else....". We chose to wait and decide to go Guangzhou NGPDT clinic to "try it out". 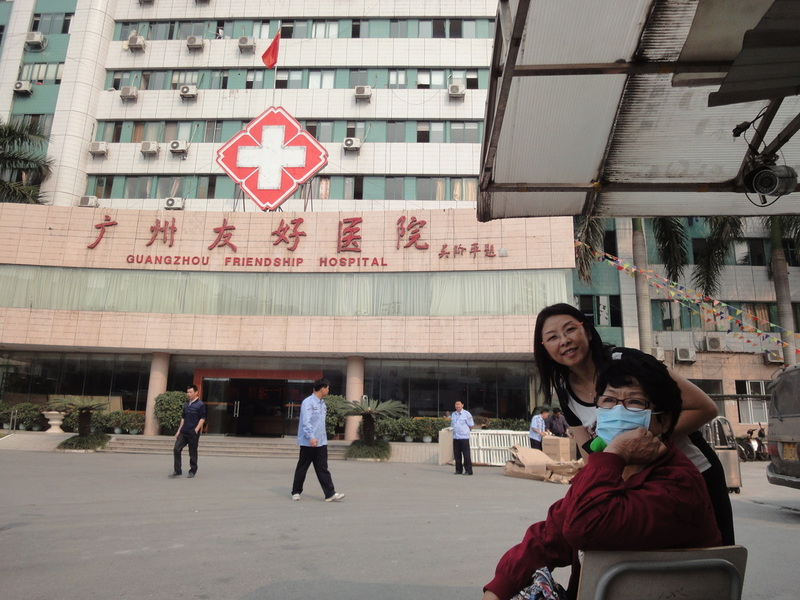 When friends heard that we were going China for treatment, they exclaimed "Oh No! 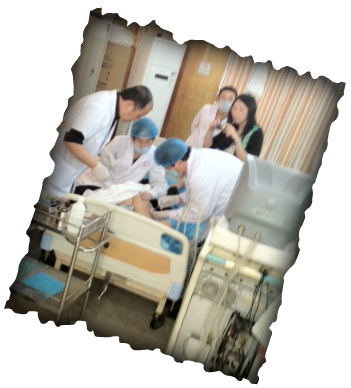 Don't trust the hospital in China!". When we revisited the Oncologist in Sept again, we were told "tumor had increased in size, you MUST do it now! there is no time". We chose to wait and stayed on course and did the second NGPDT. And in December, another Pathologist told us "Don't take medical decision in your own hands, leave it to the professional. You need to act immediately". Another Oncologist told us "I don't believe shinning laser on cancer will work, all this hocus-pocus stuff are misleading. Imagine the amount of damage the body would sustain with intense laser light exposure?" I asked her "Is exposure to radiation treatment more intense and harmful than Laser light?" And she replied "That's not the point. The main point is to treat cancer by removing the source (tumor) through chemo/surgery, and then stop the cancer spread with radiation - that is the main thing... we have statistics to show survival chance is 50% with chemo, another 15+% with surgery, and 10+% with radiation". We chose to do a third NGPDT treatment instead of surgery and chemo therapy. After 9 months, the Petscan showed that the tumor size had no grown in size and no spreading to other organs and reduced vascularity! We went for a 4th NGPDT treatment (March 2012) just to be sure. And it was confirmed by NGPDT expert from Beijing during the treatment that the blood vessels feeding the tumor had been severed. From our experience, whichever treatment methods you all chose to take, stay on course and stick to one approach. Unless reports and empirical data shows you otherwise, don't change methods. Most experts, or friends, or people with hearsays, will tell you many other methods had work for others. Please, please, do your own research. Talk to the patient and care giver. Ask all the direct and tough questions to the experts before making a decision. Be open to possiblities. Never close your options until you have researched on every one of them. The choices are many, yet, the right one could only be 1 for you. I am thankful that the professional team from NGPDT (Scott Waters, Michael Cho, Dr Sasha Alexander, Dr Lim Eng Huat, Dr Lee, Dr Kong, Mrs Kong, Dr Ye and other caring nurses, radiologist and administrators) had provided so much care and expertise to helping my Mom. They were open to discussions, not threatened by all my direct intrusive questioning, and kept finding answers after answer for my need of empirical proof of cancer death. Thank you ALL! It been a long passage through stormy weather and now we sail into clearer skies and smooth wind for us. BIG THANK to you all. And Thank You for all the web-site visitors and other cancer patients who provided morale support and comments. I will develop this website into a full-website with it's own domain name. I will post all these comments, facts, and experience there. My Mom's hope, through this website, is to provide information for others who are seeking alternative therapy to this thing call Cancer - much misunderstood illness, disease, or health issue inside us. Wishing the best to all of you out there. Make the conscious choice to: Eat healthy, Live happy, and turn Stress into positive energy to help others! Alex on behalf of Mom, Madam Thoo. 27 Mar 2012. It's been 10 months since we first known of Mom's breast cancer. We received clear indications of positive response to NGPDT treatment. Despite countless professional recommendation by Oncologist and Surgeons to operate and removal of tumor and most of the lymph nodes under the arm, followed by chemo-theraphy and Radiology, we continued with NGPDT (Next Generation PhotoDynamic Theraphy). Thanks to NGPDT method of cancer therapy Mom condition has improved without any harmful chemo, radiation or surgery. Yesterday, the Doppler Ultrasound analysis done by the NGPDT team at GuangZhou's You Hao Hospital indicated reduced vascularity activities around the tumors. The size may not have reduced significantly. However, the larger mass shown almost no vascularity (no blood vessels leading to it). The outline of the mass also seem solid and smooth (indicating not an active growing tumor). There still is a smaller lump that has some vascularity at the lower (south) area. We need to address it in the next 2 days with intense NGPDT needle Interestitial treatment. The lymph node lump has reduced in size from 1.9cm to 1cm as well. 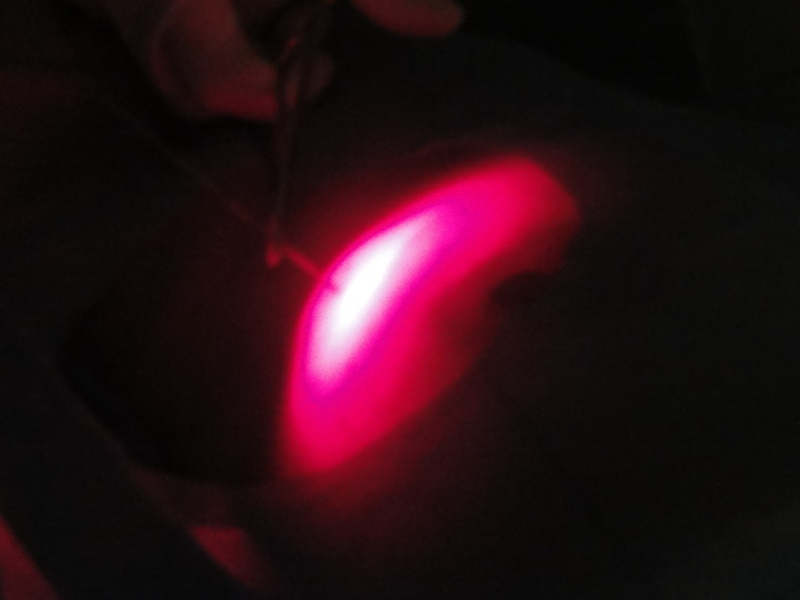 Injecting Photosynthesizer into the center of the tumor. This helps the absorption so as to maximize the respond to light treatment. In the next 2 days, Mom will receive NGPDT Photosynthesizer agent via oral intake, inhalation and injection. 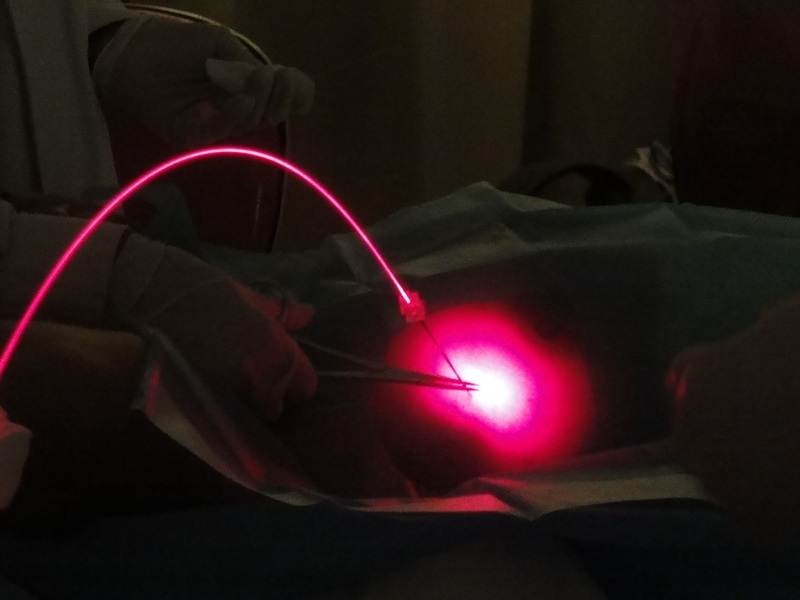 Then several Interstitial needle would be injected to deliver the laser light targetting the tumor area. In this way, the tumor cells would have absorbed the photo-sensitizer agent via 3 methods - via the blood from oral and inhalation and directly from injection. When the light is administered, these tumor cells will react to them just like a photosynthetic process (similar to chlorophyll in green leaves, the photosysthesis process generates oxygen upon exposure to sunlight). For NGPDT, the exposure of light will caused the photo-sensitizer agent molecules which has been attached to the cancer cells (24 hrs ago) to emits singlet oxygen. As tumor cells are anaerobic (lives in non-oxygen environment), these oxygen rich environment will cause raptures the cellular walls of the tumor cells, hence killing them. This allows the body immune systems to recognised these raptured tumor cells as foreign bodies and attack it to rid the body of them.